It's time for Elsa to breaks naughty! The perfect girl is gone! 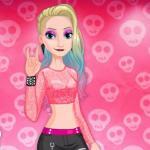 That's why frozen princess decided to change her style and start her own punk-rock band. Elsa always was interested in fashion and now, when the punk style is a new fashion trend, she can express herself this way. The first performance is about to start pretty soon. The concert hall is full of fans and all lights are focused on stage. The only thing left is totally new look for Elsa. No right, no wrong, no rules for her! Choose the perfect outfit don't be afraid to mix and match blue fur-coat with plaid jeans, or feather top with spiky shorts. Add some risky accessories and pick the cheeky hairstyle.